I ADMIT, I HELD some apprehension walking toward Imminent Brewing in downtown Northfield late Saturday afternoon. I was on my way there not only for some great craft beer, but also to read poetry as part of a Beer Poetry Contest. Would beer drinkers embrace poets when they stepped up to the mic? Or would they consider them an intrusion on an otherwise kicked-back afternoon at this former National Guard armory garage? La Crosse, Wisconsin, celebrates Oktoberfest each autumn as noted in this Minnesota Prairie Roots file photo taken in 2015. There are bars aplenty in this college town. Much to my delight, the crowd that filled the expansive space and overflowed onto the patio welcomed the writers of beer poems with enthusiasm. Folks listened and laughed as poets read of the beer culture in La Crosse, of Imminent Brewing staff and beer, of the days when a quarter would buy a glass of brew and more. For my free beer, I chose Minnesota Hop Mess, Imminent Brewing’s newest beer, made with 100 percent locally grown fresh hops. This promo postcard was lying on tables in the brewery. A request of “free beer for life” at the end of a rhyming poem caused an uproar of laughter. We poets did not get a life-time of free beer. But we each got a free pint. Cheers. I didn’t win the poetry contest. The top three winners were determined by audience response and input from brewery staff and Northfield’s Poet Laureate, Rob Hardy. After hearing several of the poems and noting the support some poets had, I didn’t expect to place. But that’s OK. For me this event was more about the opportunity to share my poetry, to hear other poets and to expose people to poetry in an unexpected venue. Minnesota Prairie Roots file photo used for illustration purposes only and not taken at Imminent Brewing. A bonus came in meeting Joy Ganyo, an elderly poet who intended to read, but inadvertently left the piece of paper with her poem printed thereon at home. Instead, she parked her walker at a front row table, ordered a beer and listened. I introduced myself to Joy after the readings and, in our brief chat, learned that she planned to read a poem about wildflowers during the open mic time. I asked a bit about her past and she spoke with fondness of growing up in Warroad. We also shared a commonality of a journalism background. Later I would learn that Joy once owned and operated Seven Gables Books & Antiques in Northfield. To hear her read would have been, I expect, a treat. I also enjoyed meeting Rob Hardy, Northfield’s Poet Laureate and coordinator of the Beer Poetry Contest and the Northfield Poetry Festival. Networking with other poets encourages me to continue in this craft of shaping words into works of art. Yes, even with a topic like beer. Here’s the poem I wrote and then read at the Beer Poetry Contest. Enjoy! a big fat check widening his worn wallet. credit card pressed into his slim back pocket. and the bartender slid a rag down the bar. and the bartender poured flights. tipped his bottle to the beer snob. Special thanks to blogger friend Valerie and her husband, Gary, for joining Randy and me at Imminent Brewing. I appreciate your support. An abandoned farmhouse along Minnesota State Highway 19 east of Vesta, my hometown. The house is no longer standing. This image represents my rural heritage and looks similar to the house I called home for the first 11 years of my life. Minnesota Prairie Roots file photo. MORE THAN 40 YEARS removed from the farm, my creative voice remains decidedly rural, especially in the poetry I write. My latest published poem, “Ode to My Farm Wife Mother,” honors the woman who raised me, alongside my father, on a southwestern Minnesota dairy and crop farm. My parents were of good German stock, a hardworking couple who believed in God, in family and in the land. I carry that heritage with me, ever grateful for my rural upbringing. A photo of my dad, Elvern, taken in 1980. Life in rural Minnesota in the 1960s and 1970s was hard. I see that now from the perspective of an adult. My dad worked long hard hours in the barn milking cows and equally long hard hours in the fields. Farming was much more labor intensive then. The only photo I have of my mom holding me. My dad is holding my brother, Doug. Likewise, my mom’s job of caring for our family of eight required long hard hours of labor. She tended a large garden, preserved fruits and vegetables to stock the freezer and cellar shelves, baked bread from scratch, washed clothes with a wringer washer, did without a bathroom or telephone or television for many years, and much more. My parents, Vern and Arlene, on their September 25, 1954, wedding day. Sometimes I think how much easier my mother’s life would have been had she not married my dad and stayed at her town job in Marshall. Our family Christmas tree always sat on the end of the kitchen table, as shown in this Christmas 1964 photo. That’s me in the red jumper with four of my five siblings. I write about this red-and-white checked floor in my poem. But then I remind myself of how much family means to my mom and I could not imagine her life without any of her six children. She centered us, grounded us, taught us kindness and gratitude, instilled in us a loving and compassionate spirit. She has always been mom to me, a mother now nearing age 85. But there was a time when she was Arlene, not somebody’s wife, somebody’s mother. There was a time when she and my dad danced away a Saturday night in a southwestern Minnesota dance hall. They met at a dance. Those thoughts inspired me to write “Ode to My Farm Wife Mother,” published last week in South Dakota State University’s literary journal, Oakwood. I am honored to have my poem selected for inclusion with the work of other writers and artists from the Northern Great Plains. It’s a quality publication that represents well those of us who call this middle-of-the country, often overlooked place, home. Perry Como crooning love in your ear. Then motherhood quelled your dancing duet. in 1967. Thirteen years after you married. sway of Naugahyde rocker on red-and-white checked linoleum. and your kisses tasted of sweet apple jelly. finances rocked by falling corn and soybean prices. goodness in the kindness of silence. as you shove your walker down the halls of Parkview. and the young woman you once were. Four generations: Great Grandma Arlene, Grandma Audrey, mother Amber and baby Isabelle, all together for the first time in July 2016 in rural southwestern Minnesota. Minnesota Prairie Roots file photo 2016. I took some liberties with my poem. I doubt my mom ever drank whiskey. But back in the day, folks brought booze bottles in brown paper bags to dances for set-ups. She didn’t dance in the Blue Moon Ballroom, although one once stood in Marshall. Arlene went to dances in Ghent, in a dance hall whose name eludes me. Blue Moon sounds more poetic. But the rest of the poem is factual right down to the Naugahyde rocker and my mom shoving her walker down the hallways of Parkview. FYI: You can view my poem on page 78 of Oakwood, found online by clicking here. My bio is published on page 89, listed among the other 40 contributors’ bios. I am grateful to SDSU in Brookings for the opportunity to be part of this magazine which showcases the creative voices of Plains writers and artists. I shall always feel proud of my rural upbringing, the single greatest influence on me as a poet, a writer, a photographer. WHEN IS THE LAST TIME you received a handcrafted valentine? 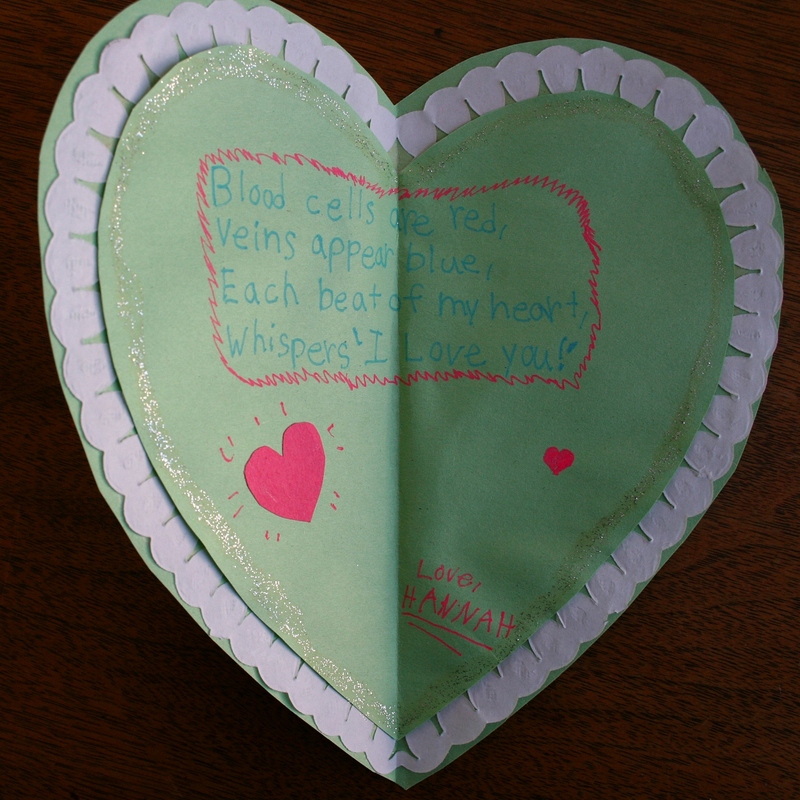 Mine arrived this week via 13-year-old Hannah’s dad handing her homemade valentine to my husband at a church meeting. Randy in turn delivered a yellow construction paper envelope to me. 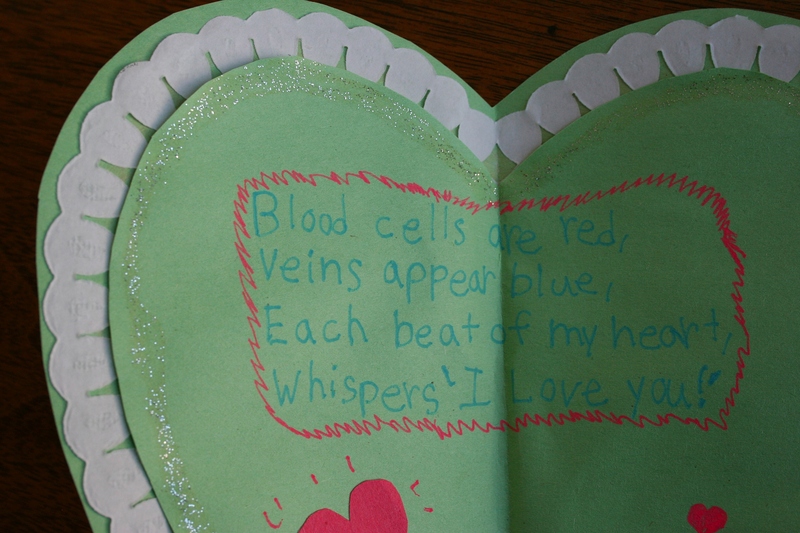 What a sweet surprise to receive a valentine greeting from this creative teen. 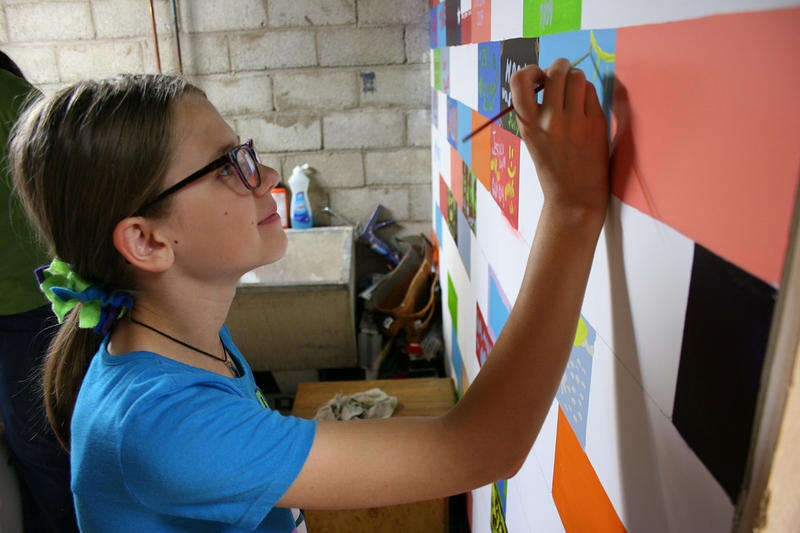 A photo I snapped of Hannah several years ago as she painted a block on a basement wall. Minnesota Prairie Roots file photo. Hannah, the daughter of dear friends, and I share a special connection. We are creative types. Specifically, we write poetry, the reason Hannah addressed the envelope to “My Poet Pal.” Ah. Melted my heart right then and there. 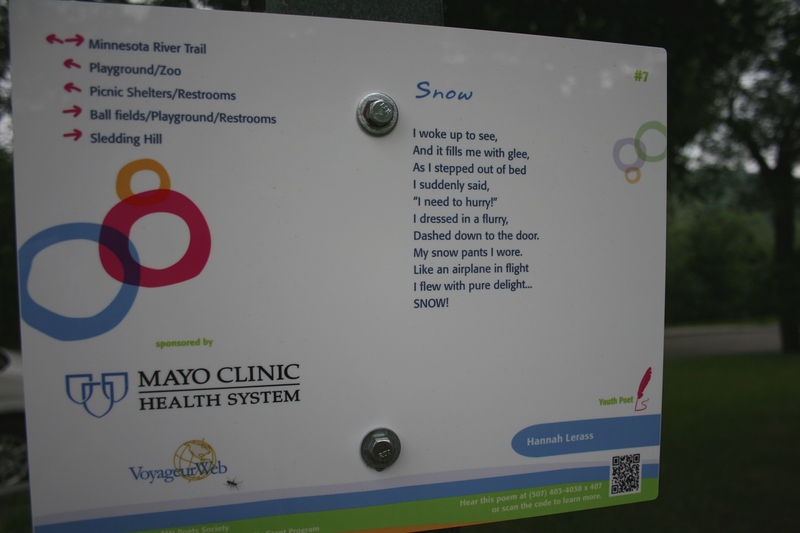 Hannah’s poem, “Snow,” posted in Sibley Park in Mankato. Several years ago I began mentoring Hannah in poetry. She loves words and rhythm as much as I do. And, like me, she had a poem selected last spring for inclusion in the Mankato Poetry Walk and Ride. You can read all about that by clicking here. Hannah’s poem is especially fitting since I donated blood recently via the American Red Cross. Hannah had no way of knowing this. But wait, there’s more. My valentine is green, not red. Hannah knows that green is my favorite color. If you’ve ever mentored a young person, you know that this nurturing and encouraging and caring blesses you as much as the recipient. To connect, to share a passion—whether in poetry, gardening, crafting, photography—is a gift. A gift. The valentine Hannah created just for me. This Valentine’s Day, I received more than a handcrafted valentine from Hannah. I received a heart full of love. IF YOU’VE MENTORED a young person, I’d like to hear about it. Or if you’ve received a handcrafted valentine, I’d like to hear about that, too. Poem is copyrighted by Hannah. Perhaps you will hear that poem read today. Or perhaps you will remember, like me, that “honoring the war dead” poem recited decades ago on the stage in a small town community hall. 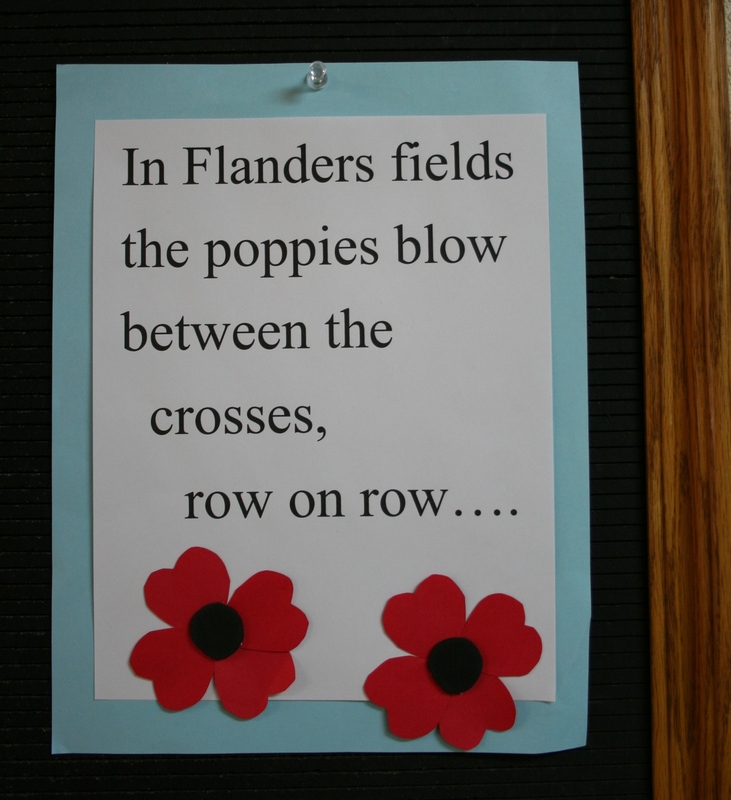 Or perhaps you will spot the opening lines of that poem on a bulletin board, like I did on Sunday at Parkview Home in Belview. My mother, a member of a nearby Legion Auxiliary and now living at this Minnesota nursing home, pointed out the mini poster she helped created. She was proud. Not of what she had done. But that those who have served were being remembered on this, Memorial Day. MY 81-YEAR-OLD MOM inspires me. She inspires me to live my life with the same positive outlook, grateful heart and kindness she’s exuded her entire life. And she inspires my poetry. In recent poetry writing endeavors (click here and here), she has been the subject of my poems. This surprises her. When I informed Mom that my poem, “The Farmer’s Wife, Circa 1960,” had been selected for inclusion in Poetic Strokes 2014, a regional poetry anthology published by Southeastern Libraries Cooperating, she responded with a humbleness that truly reflects her character. “I didn’t know I led such an interesting life,” Mom said. To most, she likely hasn’t. She grew up on the southwestern Minnesota prairie, attended Mankato Business College after high school, then worked at a government office in Marshall until marrying my father shortly thereafter and settling onto a farm near Vesta. 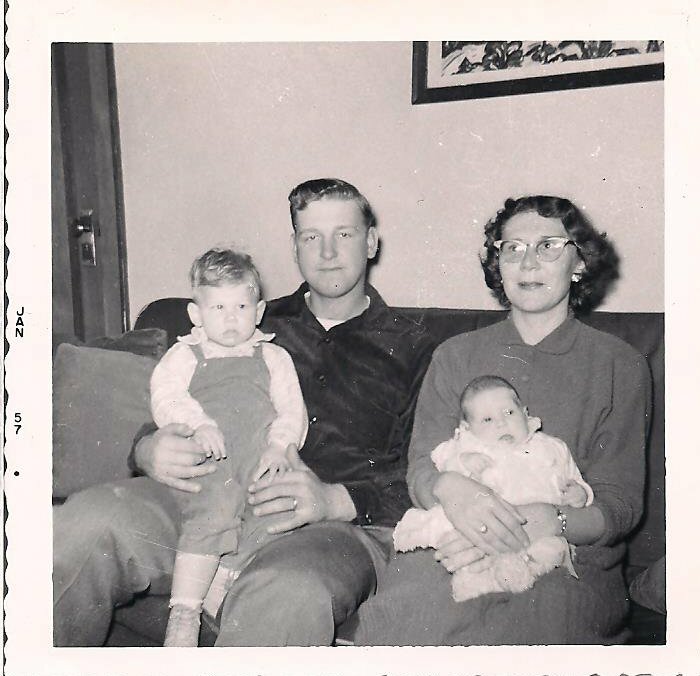 My parents, Elvern and Arlene Kletscher, holding my older brother, Doug, and me in this January 1957 photo. Rare are the photos of my farm wife mother. There she assumed the role of farm wife, the title given rural women long before stay-at-home mom became a buzzword. She no longer lives on the farm, having moved into my paternal grandmother’s home in Vesta decades ago. Although I’ve never asked, I expect she dreamed of time just for herself. On rare occasions she and my dad would go out on a Saturday evening. With those thoughts, I penned “The Farmer’s Wife, Circa 1960.” As much as I’d like to share that poem with you here, today, I cannot. That debut honor goes to Poetic Strokes, a copy of which will be gifted from me to my mom, the woman who has led an extraordinary life. Not extraordinary in the sense of great worldly accomplishments, but rather in the way she has treated others with kindness, compassion and love. Her depth of love for family, her faith and her empathy and compassion have served as guiding principles in my life. I am proud to be the daughter of a farmer’s wife. 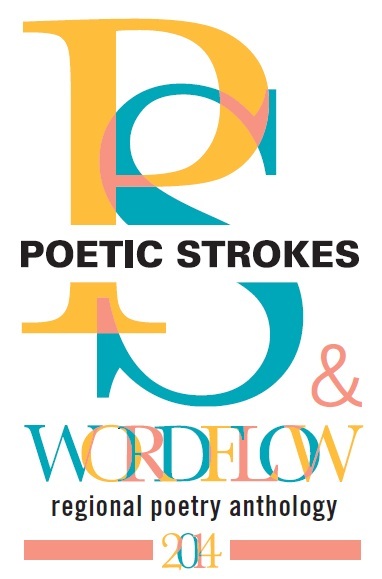 The cover of Poetic Strokes/Word Flow. Image courtesy of SELCO. I AM HONORED, for the sixth time, to have my poetry published in Poetic Strokes, a Library Legacy funded project (through Minnesota’s Arts and Cultural Heritage Fund) that promotes poetry in southeastern Minnesota and specifically in SELCO libraries. Each library will have a copy available for check out near the end of March or in early April, National Poetry Month. This year my county of Rice joins Winona County with the highest number of poets, six from each county, included in the Poetic Strokes section of the anthology. I am the sole Faribault poet with five from nearby Northfield. Twenty-three poems from 21 poets in five of SELCO’s 11 counties will be published in Poetic Strokes 2014. There were 196 poems submitted by 112 poets. Two published poets with PhDs in English literature and a third poet who is a former English teacher, fiction writer and contributor to the League of Minnesota Poets judged the entries. The general sense I received when the poems came back is that our judges felt that there was a great variety in subject matter and skill and that they were impressed with many of those that were submitted. There was also the overwhelming sense of having enjoyed thoroughly the opportunity to read the works submitted. Additionally, the anthology includes 28 poems penned by youth ages 14 – 18 (or in high school) residing within SELCO counties. Twenty-eight poems chosen from 111 submissions will be featured. What an encouragement to young poets to be published in the Word Flow portion of this project. For me, a seasoned poet, selection of “The Farmer’s Wife, Circa 1960” encourages me to keep writing in a rural voice distinctly mine, inspired by the land and the people I love. FYI: Click here to read a full report on Poetic Strokes/Word Flow 2014, including a list of poets selected for inclusion in the anthology.